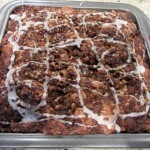 Welcome to the new and improved streusel topped and streusel in the middle Coffee Cake! And I ramped up the flavor using not only cinnamon, but two other complimenting warm spices known as Nutmeg and Allspice and yes, by gosh by golly, we have a winner! 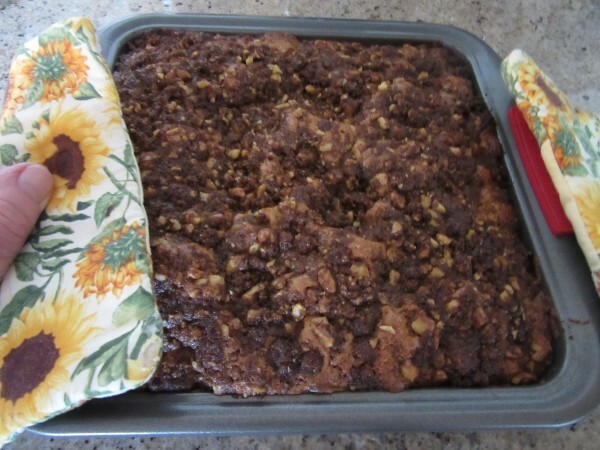 Switched out those dried up old dark raisins for some moist, chewy, sweet flavored golden Sultanas and in my vision, I’m sitting in a meadow on a warm summers day surrounded by flowers and butterflies, sipping coffee and LOVING this breakfast delight instead of “coffee cake after church.” Whew! I am tired now, but we have to go build us a superb, moist, chewy, flavorful coffee cake that is not going to make it to church this Sunday! Streusel on the top and Streusel in the middle. 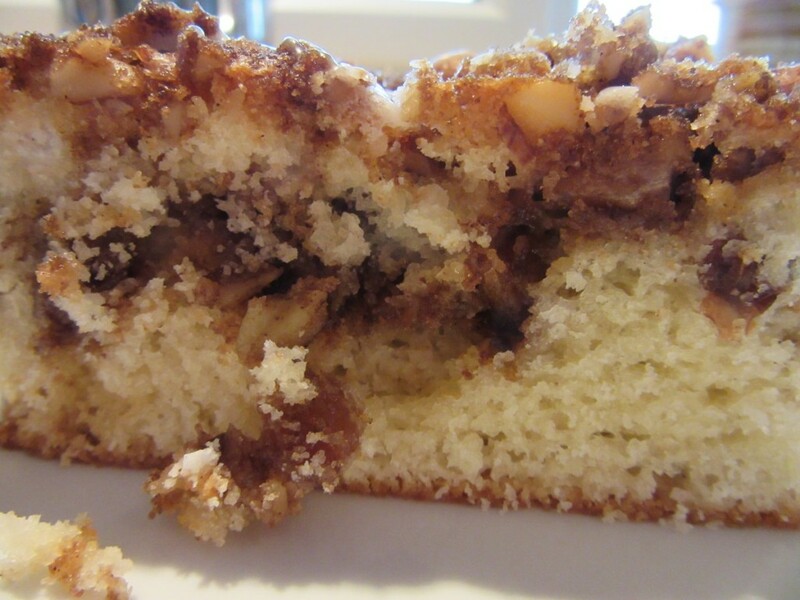 With every forkful you have Streusel, not a little! 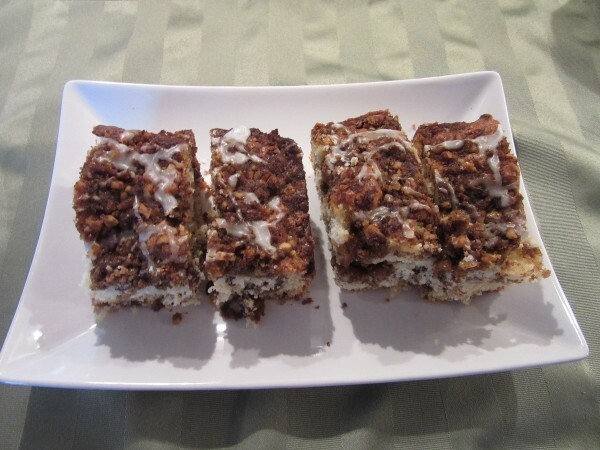 Coffee cake generally has a denser crumb and a tad drier than your typical 2 layer dessert cake which makes it go perfectly with a cup of coffee, tea or cocoa for the kiddos. My friend Pam was here visiting from the USA and I made this especially for her. She raved about it and I hope you will too! Pre-heat Oven: 375 degrees. Grease a 9x9 pan. This is what we'll need! 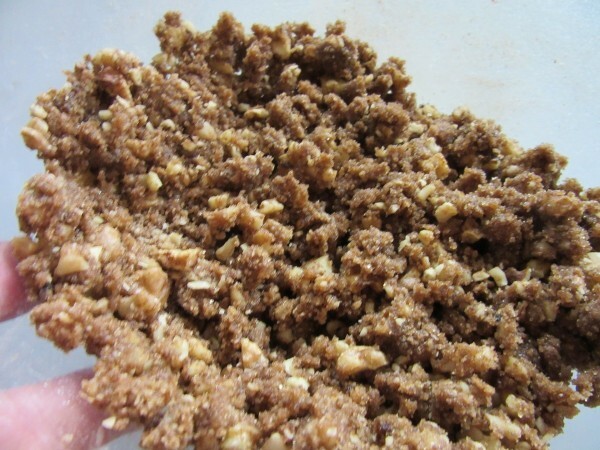 In a medium sized bowl, combine the chopped Walnuts, Brown Sugar, 2 TBSP AP Flour, Butter, Cinnamon, Allspice and Nutmeg. Mash it all together using a couple of forks, or as I did, rub it together between your fingers until it is well mixed. Like this. Then set it aside. 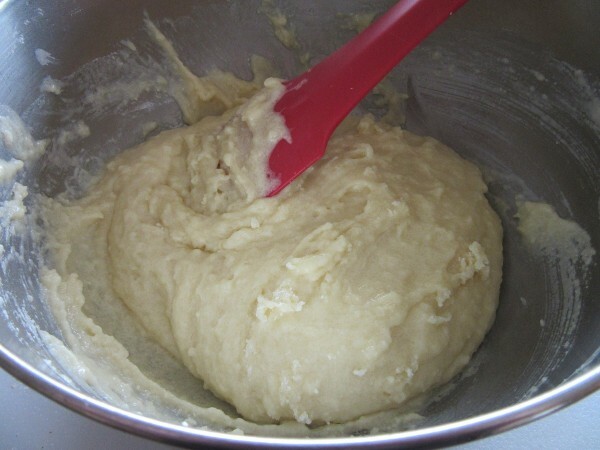 In another medium sized bowl, combine the AP Flour, Sugar, Baking Powder and Salt. Stir it together well. In a measuring cup, place the Oil and Milk. Add the beaten Egg and stir until well combined. 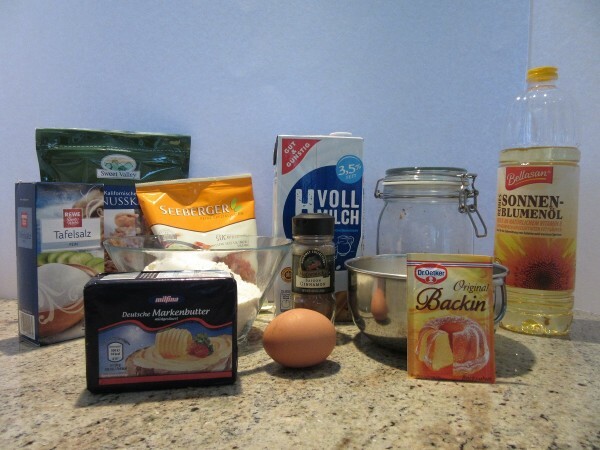 Then add this to the dry ingredients. Stir just until combined. 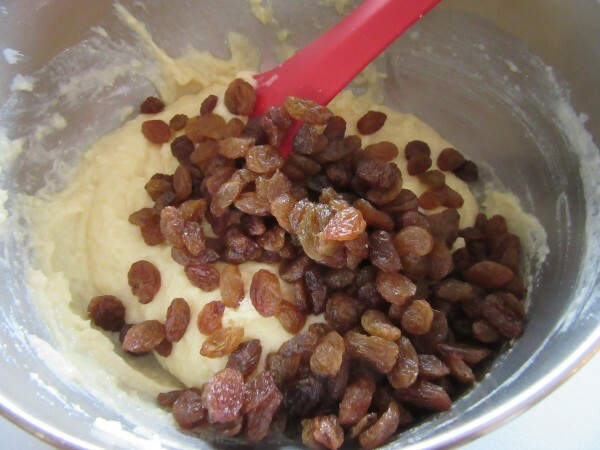 Add the Sultanas and stir to make them spread evenly through the cake mixture. Spread 1/2 of the cake mixture evenly in the 9x9 inch pan. Top with 1/2 of the Streusel Mix. 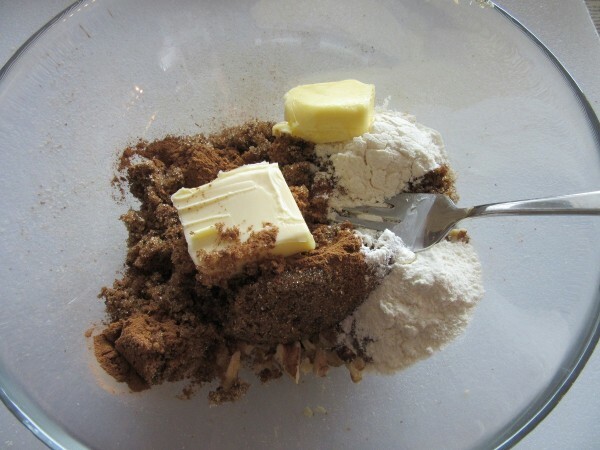 Drop the remaining cake mixture by spoonfuls across the Struesel topping and carefully spread it out. I found that wetting my fingers and using them to spread made this step a whole lot easier. 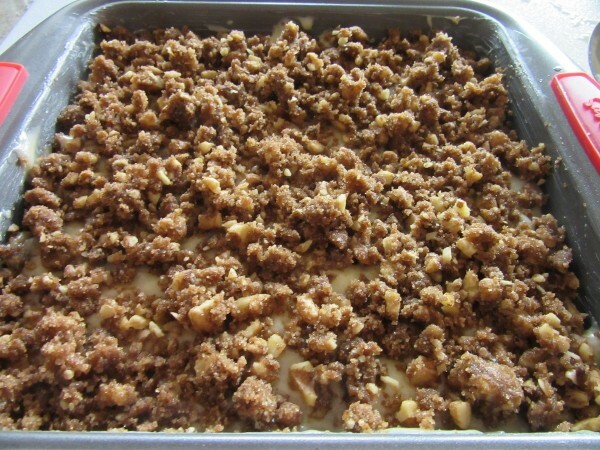 Top the cake mixture evenly with the remaining Streusel Mix. Now we're ready to bake! Bake the Coffee Cake in a pre-heated 375 degree oven for 25-30 minutes until a toothpick inserted in the middle comes out clean. 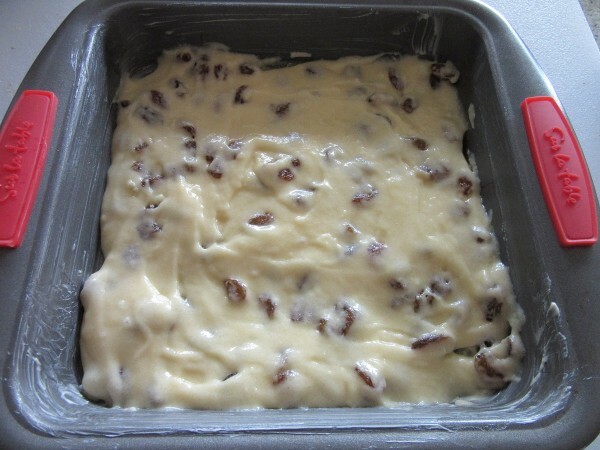 Remove from the oven to a cooling rack, then prepare the icing drizzle. 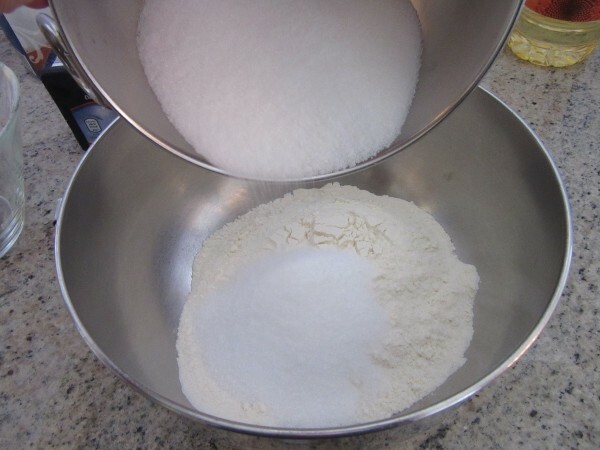 Place the Powdered Sugar in a small bowl, then add 2 TSP of Water. Stir until combined. You want it the consistency to slide off the end of a spoon. Add another TSP Water if necessary. Drizzle the icing artistically across the top of the cake a lot more prettily than I did. I just can't get the proper "Drizzle" technique! Serve warm or at room temperature and enjoy. Lucky Pam to have had this while visiting you. My mouth was watering just looking at the picture. I’ll have to try making this. I so appreciate your taking the time to comment! If you like Cinnamon and Spice, this cake is for you. Glad to see this recipe. My son says I always made him a Steusel cake for his birthday. Well I looked last year for the cake mix(I knew I didn’t do it from scratch) and they don’t make it any more. I felt so bad that I had to make him a sad yellow cake instead. Now I will have your recipe for this year. One thing, I won’t put the raisins in it. I hope that will be okay. Thanks Karen for all the great recipes. Thanks for taking the time to comment. The Streusel Cake is easy to make from scratch and I’m sure it will be fine without the Sultanas, but they sure add some extra goodness. Now, you won’t have any excuses not to make your son a cake. I don’t know if that’s good or bad! Will definitely be trying this one. Looks delicious, not to mention quick and easy! Thanks for commenting! Sparky says it is a definite winner!